After convincing myself, Stuart Smalley style (I’m good enough, I’m smart enough and dog gone it, PEOPLE LIKE ME, repeated into a mirror), I started researching what to make. I teased the basis of the project in this post about How to Paint with Sharpies and Alcohol. The theme of the event that the auction is being held at is the Kentucky Derby, so I did want to pick something outdoorsy. 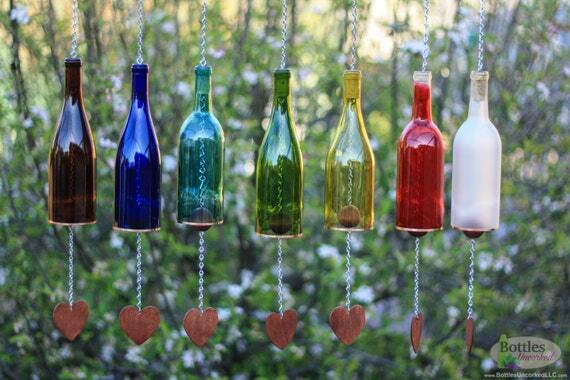 After a LOT of debate, I decide on making wind chimes. I reasearched types of wind chimes, where to buy materials and how on earth to string these things together so that they are somewhat symmetrical, I finally decided on a large scale wind chime/wall hanging that is hung from a birch branch with the chimes in a triangular shape. Once I had mastered the Sharpie/Alcohol painting technique, I brought the chimes, sharpies and rubbing alcohol into art class and taught the kids how to paint their chimes. Every chime is unique and each child signed the back of theirs, making this a truly one of a kind piece. Once the chimes were painted, I had to VERY CAREFULLY transport them back home so that I could seal them and then assemble them onto the birch branch. I will tell you, that was not the most fun part of the process. It was a lot of trial and error on how to get them assembled symmetrically. It took the better part of an afternoon. The project was quite time consuming from start to finish, but the outcome is worth it! Paint your ornaments. These will become your chimes. The instructions for painting with Sharpies and Alcohol can be found in this post. 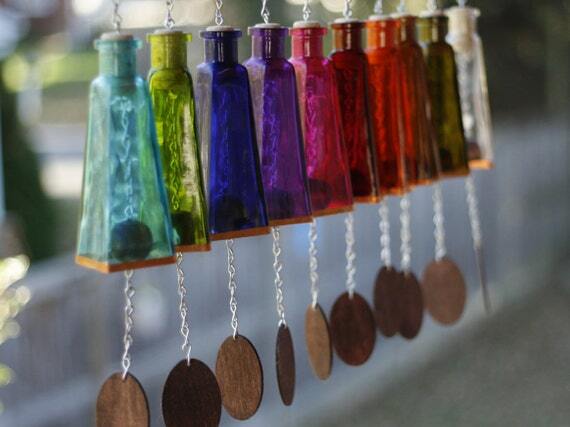 After allowing your chimes to dry, seal them. If you are planning to paint the backside of the chimes, do so after the first side has dried, has been sealed and has cured for at least a couple of days. I had the students sign the back of the chimes on the same day that they painted them. When I sealed the painted side, some of the signatures on the back got smudged from being laid down on newspaper. I had to touch up the names and then I sealed the side with the signatures after the painted side had dried and cured. Instructions for how to seal the painted chimes can be found in this post. Determine the lay out of your chimes. I knew I wanted a triangular/V shape, so I planned out where I would need to attach them and spacing. Leave enough room so that none of the chimes are actually touching, but close enough that if there is a light breeze they will move into each other to create the tinkling chime sound. My birch branch was about 24 inches wide and I placed the hooks for hanging the chimes, about 2.5 inches apart. Honestly, I mostly eye balled this part and it took a little bit of trial and error to get it the way I wanted. For my 21 wind chimes, I needed 11 hooks to attach the chimes to: I marked off with pencil where I wanted the hooks to go on the log and then screwed them into the branch by hand. Not the most fun part of the project. Maybe use some pliers to help twist the hooks into the log! 5. Attach the first chime to the first hook at the far left of the branch. To do this, I tied off the open end of the fishing line that is attached to the chime, and then repeated the same knot from above to attach the chime to the hook. 6. Continue with the rest of the first row checking to make sure your chimes are hanging approximately evenly. For instance, the First hook is going to hold one chime which is the first chime of the first row. The Second hook is going to hold one chime which is the first chime of the second row. The Third hook is going to hold two chimes which are the second chime of the first row and the first chime of the third row. The second chime will be attached to the chime above it using the same process we used attaching the chime to the hook. I know that sounds super confusing, but it will make more sense when you have it laid out in front of you. And that’s it! This was by far the most difficult thing I have ever made. It was time consuming, but also a lot fun and definitely challenged my crafting my abilities. It also challenged my writing abilities, because it’s definitely an involved tutorial. Please feel free to let me know if you have questions or if something I wrote makes zero sense! If You Like It Then You Shoulda Put a Pin In It! I loved the way these came out, just, if I didn’t stress it enough in the article, they are VERY time consuming. Making the chimes is quick and easy and fun for the kids, but to seal them the Krylon works, but if they are going to be hung outside in the elements, a resin coating would be better. I just noticed I didn’t update that in this post. If you’ve got some crafty mom friends who are willing to help with that part, I would recommend it! If they will be hung indoors, the Krylon should do fine. If you make them I would love to see them! I would also love these as a set of ornaments, actually. Skip messing around with making them into wind chimes and just have a beautiful unique set of ornaments for Christmas. Just make sure you still seal them. Thanks for sharing this project! I’m considering doing this for a school auction. The ceramic discs that you linked to–is it the 3″ glazed discs? Seems like that many of them would be SUPER heavy, no? Hello! I am desperately looking for an auction project and really like this one! I clicked on the link for the ceramic discs….want to make sure I order the right ones, can you confirm for me? Hi Suzanah! That’s great! Good luck with it! You will probably need to research how to seal them if they are going to be around heat, I didn’t test them for that. But I’d love to see how it turns out!